Apologies for the late and rather terse update today, but your humble narrator was a mass of bruises and blisters upon awakening this morning. It’s no viral outbreak, I assure you, rather its the sum total of having spent nearly every hour of daylight yesterday out shooting. Lots of cool stuff is coming, but for today, a shot of my beloved Creek with the Shining City beyond. 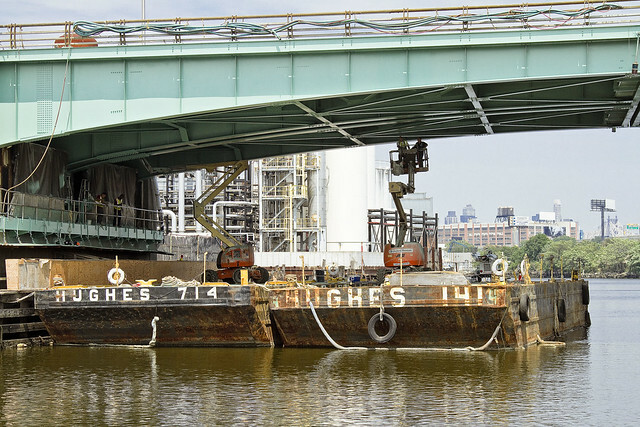 This is at the junction of Newtown Creek and its Dutch Kills tributary, btw. 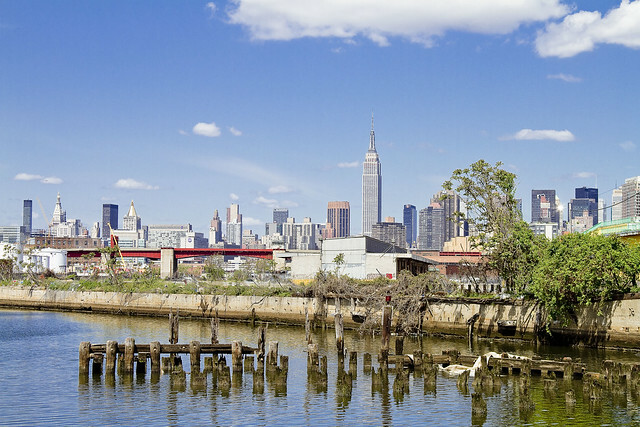 Staten Island walking tour with Mitch Waxman and Working Harbor Committee, tickets now on sale. A ladder to heaven in Hunters Point. As mentioned in the past, the East River ferry is a boon to one such as myself, as it allows for the preclusion of entering the subway system. As much as I enjoy entering a sweltering concrete bunker and being painted with pneumatically driven clouds of dried sewage and powderized rodent dung, a humble narrator will literally find any other possible way of getting around than the using the underground. Seriously, who can guess- all there is- that might be buried down there? Arriving in ancient Hunters Point one recent day, I was greeted with the tableau depicted in today’s shots. 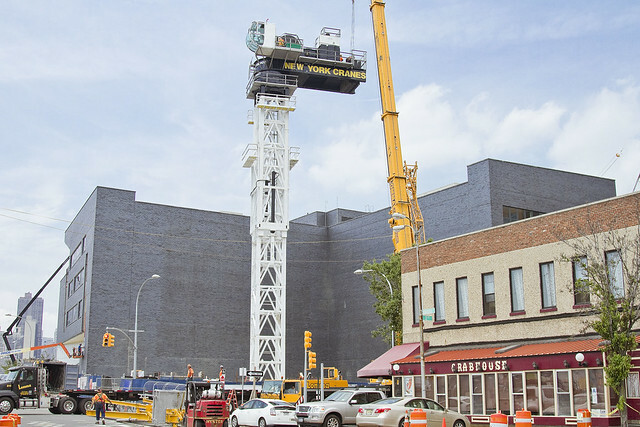 It would seem that yet another bit of construction equipment is being prepared for duty, this time in front of the LIC Crab House on Borden Avenue at the corner of 2nd street. The new school, which is the gray wall you’ll notice in some of these shots, is nearly complete. The Hunters Point South project, on the other hand, is just getting started, as evinced by the looming construct being assembled. 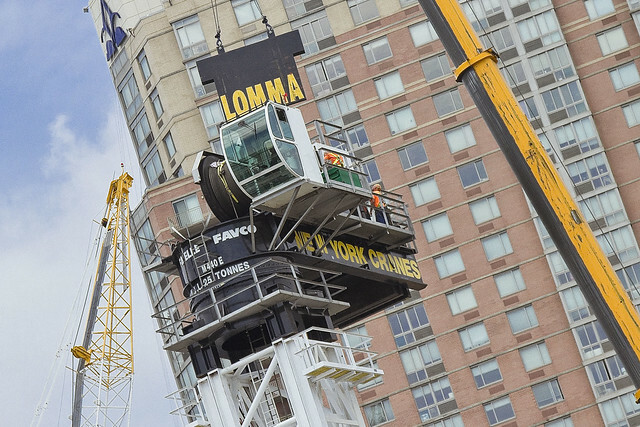 The crane constructing the crane was enormous, incidentally, towering over the former Miller Hotel (nowadays the LIC Crab House) where Battle Axe Gleason would sit in a barber chair and greet those who debarked from the LIRR ferry. Gleason was the last mayor of Long Island City, a reputed scoundrel, and his private offices were just around the corner. 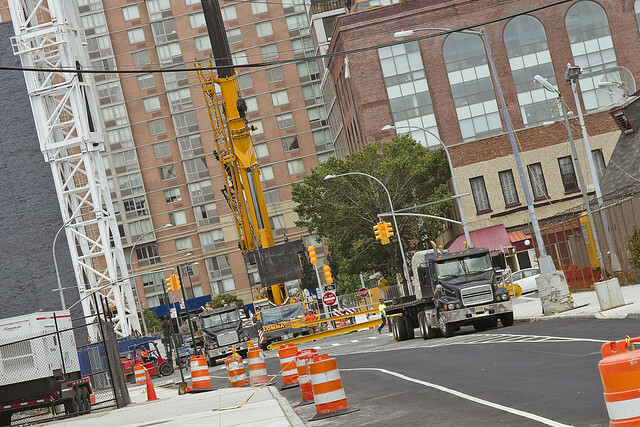 Just for the sake of pedantry, the self propelled yellow crane is of the “telescopic” variety and the unit being assembled is a tower crane. Scenes from a short trip up a long Creek. 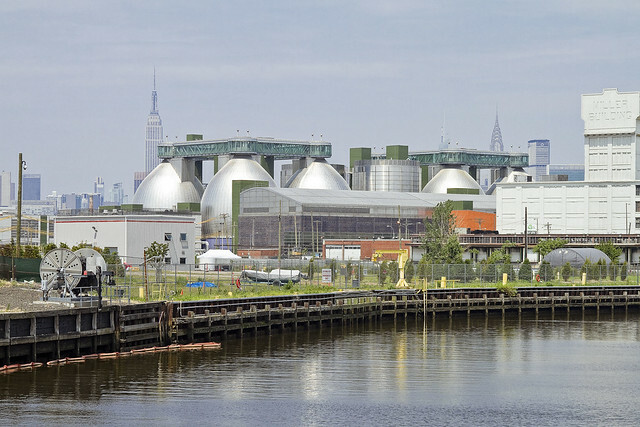 As you may have heard, a body of water called the Newtown Creek provides a visual indicator of the currently undefended border of Brooklyn and Queens for several miles leading back from the East River. 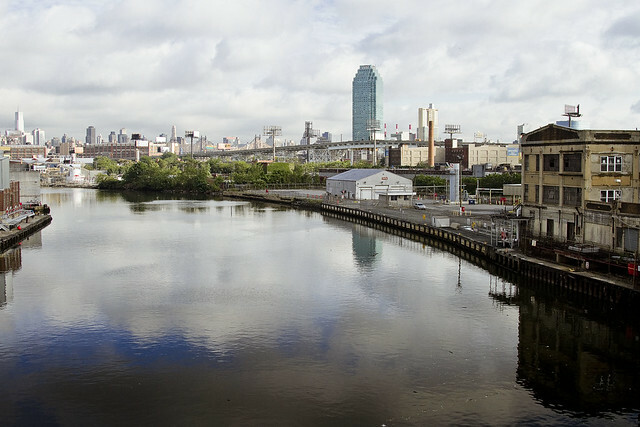 An industrial waterway with a troubled past and increasingly bright future, there are several bridges which span its polluted depths, and one of them is the JJ Byrne or Greenpoint Avenue Bridge. 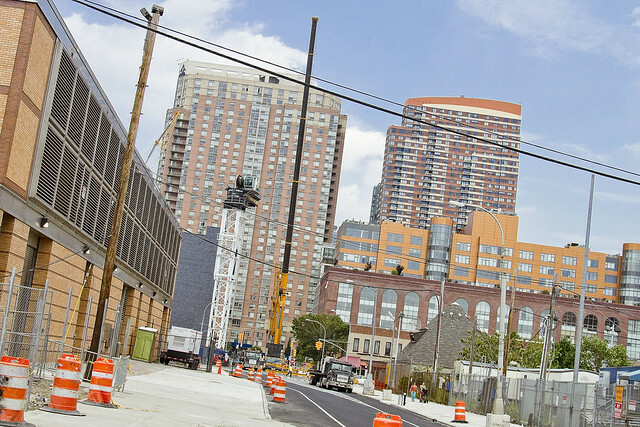 It connects the Blissville section of Long Island City in Queens with the Greenpoint neighborhood of Brooklyn. A draw bridge, it is currently receiving a bit of spit and polish. Great enjoyment is experienced in presenting and narrating the story of Newtown Creek to the curious, most recently while onboard a NY Water Taxi whose use was donated for the Metropolitan Waterfront Alliance’s “City of Water Day” festival, but it really gets in the way of taking photos, which is my one regret. We see a LOT of cool stuff from the water. Luckily, Lisa Garrison of the Hudson River Fund agreed to come on board as a speaker, and handing her the microphone allowed me to skulk away and grab my camera for an interval. 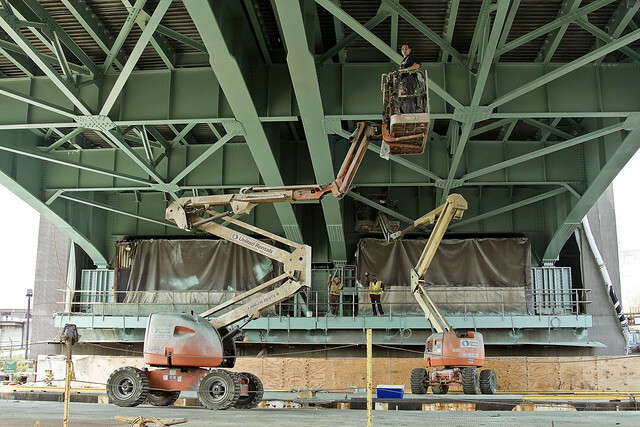 When she started describing several of the cool projects she’s been curating around Newtown Creek (including some of NCA’s tour programming last year, in the name of disclosure), your humble narrator veritably flung himself forward in contemplation of shooting these bridge painting guys at work. 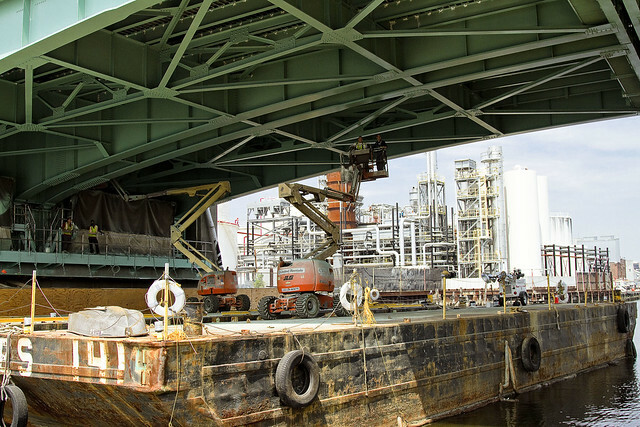 Bridge maintenance is another one of those hidden occupations most people don’t know exists, and you seldom get to see what’s going on except from the water. My pals at the North Brooklyn Boat Club see this sort of thing all the time, as they intrepidly ply the troubled waterway in kayak and canoe. Me, I like boats with motors that stand up and away from the water, but that’s me. According to documentation found here and there on the vast interwebs, this project is meant to conclude in September. 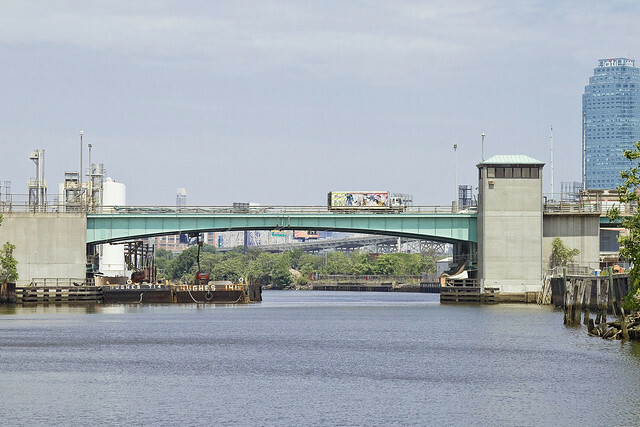 The bridge is administered by the NYC DOT, was built in 1987, and is 1.3 miles from Newtown Creek’s junction with the East River. This also explains why the bridge has smelled like spray paint lately. Maritime Sunday drifts in today. 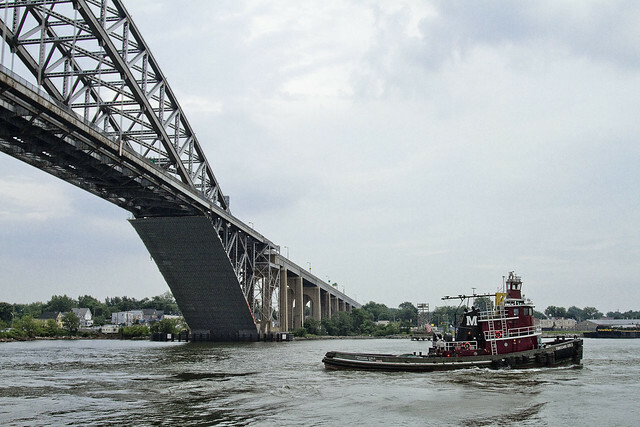 Witness the United States Army Corps of Engineers DCV Hayward as it hurtles into the so called Buttermilk Channel section of the East River. The legend of Buttermilk Channel is stated thusly- in the ancient days of the Dutch decadence, the Brooklyn to Governors Island section of the tidal strait was so shallow at low tide that farmers would drive their cattle across the muddy puddle and set them to grazing on the island. The cattle would be vouchsafed against canids or the attention of thieves by the high tide, allowing the farmers to move on to other more profitable pursuits. Returning to fetch their dairy cows at the next low tide, the farmers would find that their herds had fed on Governors Island plentiful salt grass, and the cows would produce vast amounts of wholesome milk the next morning. This is how this section of the East River came to be called Buttermilk Channel. Or so the legend states. Balderdash, claims Captain Doswell of the Working Harbor Committee, although your humble narrator argues for the historical record and colorful story. We agree to disagree. 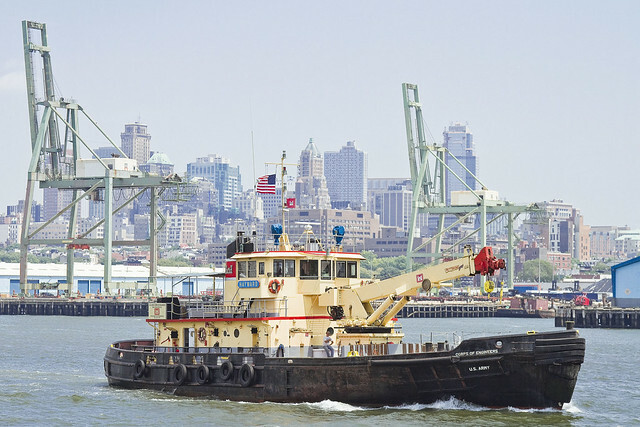 Subsequent dredging, much of it accomplished by the stewards of the Hayward- the USACE- allows a maritime channel of sufficient depth to disallow the transit of cattle to Governors Island from Brooklyn in modern times. The maintenance of this channel, specifically keeping it free of floating debris which could impede or injure vessels plying it, is the responsibility of skimmer boats like the Hayward. 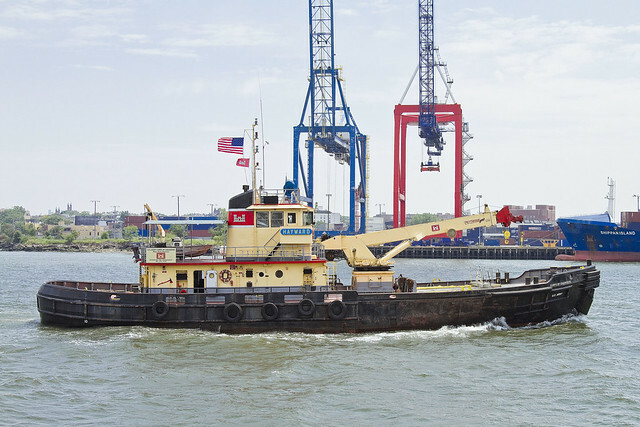 Built in 1974, Haywards’ crane can handle 120 tons, and she is specifically a “drift collection vessel.” Hayward is one of three such vessels the USACE operates in New York Harbor (with the 1948 vintage Driftmaster and the 1980’s Gelberman) which remove just north of 100 tons of debris from the water annually. This debris includes downed trees, trash of all sorts, really anything that might find its way into the water. Sometimes this can involve downed aircraft. 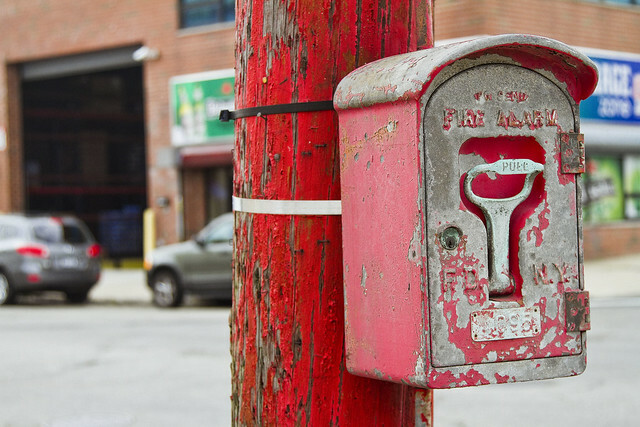 This bad boy is on Grand Avenue in Maspeth, and seems to be one of the few fully functioning Fireboxes in the area. It’s stationed in front of what used to be a cardboard box factory, which is a tremulous duty. Shine on sweet Firebox, shine on. Getting high in Western Queens. As some of you may have discovered, your humble narrator is bringing his personal brand of wide eyed paranoia to Brownstoner Queens in a bi weekly column exploring some the lesser known and esoteric corners of Western Queens for a couple of months now. Recent endeavor found one at the summit of the Standard Motor Products Building at the corner of Northern Blvd. 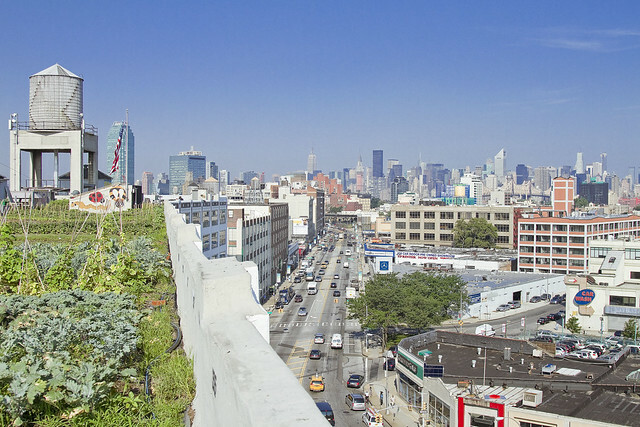 and Steinway/39th st./Harold Avenue visiting the startlingly cool Brooklyn Grange Rooftop Farm. Check out what I saw up there by clicking here. For a full inventory of what I’ve been doing over at Brownstoner, click here. 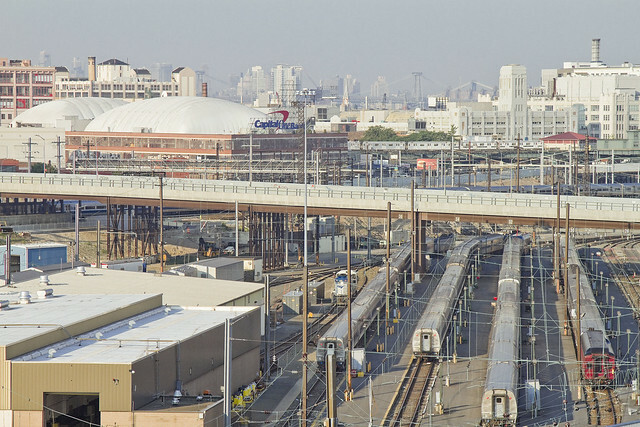 A second posting spawned by the visit looked over the walls and witnessed the majestic Sunnyside Yard from on high, which can accessed by clicking here. Just yesterday, an interviewer working on an unrelated project asked me what my reaction to “demolishing the Javitz Center in Manhattan, then decking over the Sunnyside Yard and building a convention center and hotel complex on the deck” would be. Roughly an hour later, after a far ranging diatribe about storm water, CSO’s, and endemic PCB contamination- the question I asked the interviewer was “How, in any way, would this benefit Queens other than the creation of low wage service industry jobs?” (and a short interval of construction industry jobs, of course). I suggested we deck over the yards and install 192 acres of farmland or just a plain old park. Didn’t Central Park spur development of underutilized land surrounding it in Manhattan 150 years ago, creating what are today the most valuable residential properties in the entire city if not the world? 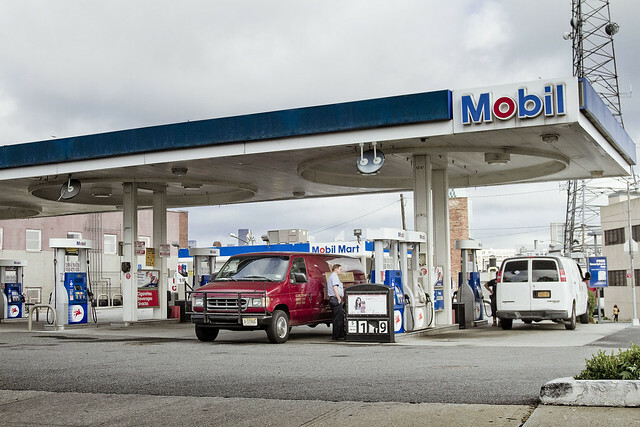 Why not add something green to spur growth, whatever the hell that is? I also asked the interviewer what the hell “vibrant and diverse” is supposed to indicate or mean. Please, planners, leave your air conditioned Manhattan offices and actually come to Queens. Leave the cars and bicycles behind and actually walk around. 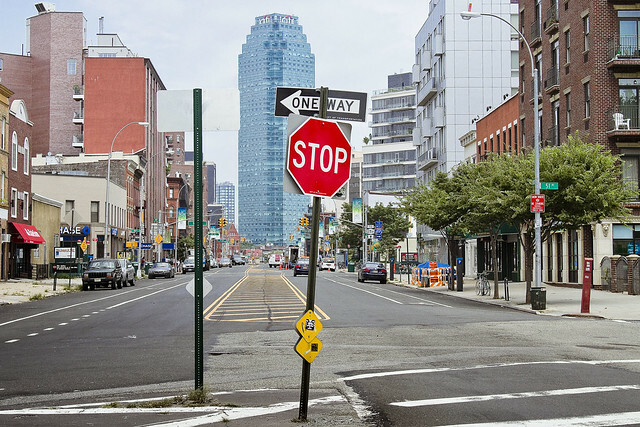 We don’t need any more of Manhattan’s problems exported to us, as Queens’ biggest problem is the City shitting on us every chance it gets. Sorry for the late update today, had a few connectivity problems this morning. I’ll be out and about all weekend, if anyone has anything going on they’d like me to record or write about- please contact me here. It’s Furrinalia, an ancient Roman holiday venerating Furrina. Furrina was a water goddess of truly ancient origins, one of the 12 “flamines minores.” July 25 is “one of those days,” when random events in the calendar as revealed by the historical record seem to be propitious in retrospect. Events speak of broad strokes and suggest some sort of guiding hand- although that’s 20/20 hindsight and western bias talking. Coincidentally, July 25 is also the day that the Inca empire celebrated its thunder god Ilyap’a, who kept the Milky Way in a jar and used it to make rain. After his Dad died, a fellow we refer to as Constantine the Great was proclaimed the emperor of Rome by his troops in 306. A scant 9 years later, the “arch of Constantine” was unveiled in Rome, hailing the victory of the General and his armies at the Milvian Bridge- a battle made famous by the Emperor’s conversion to Christianity, which was an event signaling that the end of the pagan era in Europe was nigh. In 1261, the armies of Michael VIII Palaiologos recaptured the city named for Constantine from latin usurpers, beginning the final iteration of the Roman Empire which would end in the fires of 1453. In 1837, the first electrical telegraph was demonstrated in London. In 1866, the newly created post of “General of the Army” in the United States was awarded to Ulysses S. Grant. In 1898, United States troops began the invasion of Puerto Rico, and in 1946 an atomic bomb was detonated at Bikini Atoll. Today is the day that Dylan went electric in Newport, Connecticut in 1965, and 1978 saw the birth of the first “test tube” baby. In 1984, Salyut 7 cosmonaut Svetlana Savitskaya becomes the first woman to perform a space walk. Also, in 1966, New York City Council speaker and Mayoral candidate Christine Quinn was born in Glen Cove.